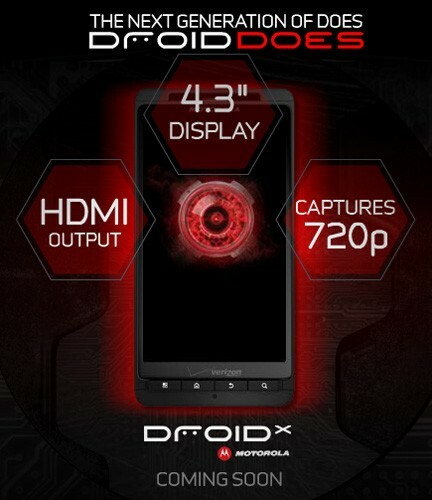 Looks like Verizon and Motorola are coming clean with the Droid X a little earlier than planned -- it just appeared on the official Droid page, complete with confirmation of that 4.3-inch screen size. Interestingly, rolling over the image reveals a box that says it has a "720p screen," which would be crazy -- especially since the Droid X prototype we played with had what looked to be the same 854 x 480 resolution as the original Droid, although we couldn't confirm it at the time. A true 720p screen res would also be far denser than the 800 x 480 panel on the EVO 4G, so we're thinking Verizon actually means 720p out over HDMI, not anything else. We'll see though -- the official launch event is still set for June 23, and we're still waiting to find out about the slider Droid 2, so there are a lot of potential surprises still to come. Update: We just confirmed that the Droid X prototype we saw had an 854 x 480 display, so we'll have to see if Motorola and Verizon have a serious surprise for us come Wednesday -- we know at least one Engadget editor who's crossing his fingers. Update 2: Sure enough, Verizon has changed the ad to read "Captures 720p" instead of "720p screen," so that would basically confirm the 854 x 480 display. A nerd can dream, though! See the revised site after the break.